This is the story of Yakov Petrovich Golyadkin. Mr. Golyadkin, a minor government official, is a rather middling man. Then one day he meets his "double"—a man with the same name, face, and background. Initially charmed by the coincidence, Golyadkin soon notices a discernable cooling in the reaction of his friends and colleagues, while his double seems to grow in popularity. Mr. Golyadkin, unable to escape the relentless presence of "Golyadkin junior," finds that even the most ordinary activities begin to take on a terrifying significance, until he finds himself on the verge of a breakdown. The Double introduced the concept of the split personality or divided soul that would become a common psychological feature of the characters of Dostoevsky's later novels. 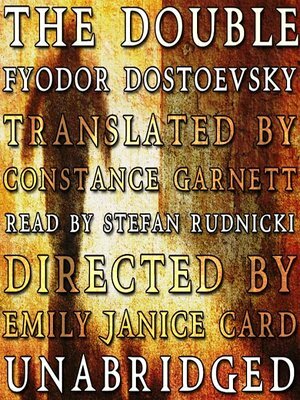 Considered the most Gogolesque of Dostoevsky's works, the novella brilliantly depicts Golyadkin's descent into madness in a way that is hauntingly poetic. The Double illustrates Dostoevsky's uncanny ability to capture the complexity of human emotion especially the darker side of the human psyche. In this remarkable work of doppelgänger literature, Dostoevsky examines the neurosis and paranoia that cripple a seemingly ordinary man, producing a thoroughly modern nightmare, brilliantly foreshadowing the works of Kafka and Sartre.